Six miles separate Cincinnati’s Lower Price Hill neighborhood from Mount St. Joseph University. For Donnie Wilson, a freshman 184-pounder at the Division III school, the two are worlds apart. Diagnosed with apraxia — a neurological condition that can make certain motor skills difficult or impossible — Wilson didn’t speak his first word until he was 6. School was torture for Wilson, centered as it is on academics and socialization. He was a first grader at Oyler School in the Cincinnati Public School system, located in Lower Price Hill, a neighborhood known more for its poverty and surrounding despair than the nurturing of hope. Slowly, Wilson would learn to talk, afflicted with a noticeable stutter that remains today. Wilson remembers the school psychologist at Oyler, John Welling. Welling would work with Wilson, as would Laura Tapke, his speech therapist. Both were pivotal for him at Oyler. Sue Fox, his seventh and eighth grade teacher, was, too. By the time Wilson had Fox in class, his father had died of cancer. Eddie Wilson’s illness brought a pinch to the family’s already lean finances. There’s discernible idol worship when Wilson speaks of his father’s mechanical abilities. It’s also present remembering his parents’ priorities. “We didn’t have a lot of money, but my mom knew how to dress,” he said. “My dad, he would always wear an old T-shirt with a pocket. He’d always have cigarettes in that pocket. “I’d give anything to drive somewhere with my dad today,” he said. Life changed for Donnie Wilson in eighth grade. “Mrs. Fox talked about Elder to me.” Wilson said. Elder High School is a private, all-boys Catholic school in Cincinnati. Fox’s husband and sons attended Elder. She realized Wilson needed the added structure Elder could provide. Fox made calls about financial aid possibilities, working with Wilson’s mother, Jackie, on applying. In the spring of his eighth-grade year, Wilson learned he was accepted to Elder. Dan Kreimer — now in his 54th year of teaching — would be a life-preserver in the vast ocean of Wilson’s new and unfamiliar surroundings at Elder. Halfway through Wilson’s junior year, even the reduced-tuition portion was becoming difficult for Jackie. Donnie Wilson was anxious, figuring he’d have to leave the school he’d grown to love. Hearing of his plight, an anonymous donor paid the remaining balance of Wilson’s junior and entire senior year. And maybe that’s what this story is about — good people helping a good kid in need, and a college wrestling coach who’s never known his role in Wilson’s story. Towards the end of eighth grade, Wilson was invited to hear Ohio State coach Tom Ryan speak. Ryan was in Cincinnati to deliver a clinic and talk. Wilson caught Ryan’s talk with his mom. Both felt kinship with Ryan’s message of overcoming, of finding purpose in hardship. Jackie responded like any good mother. In Wilson’s senior year, he compiled a record of 23-3 wrestling for Elder’s varsity “B” squad — backups who wrestle in smaller varsity tournaments. Wilson is 0-4 this year, his freshman year for the Lions. 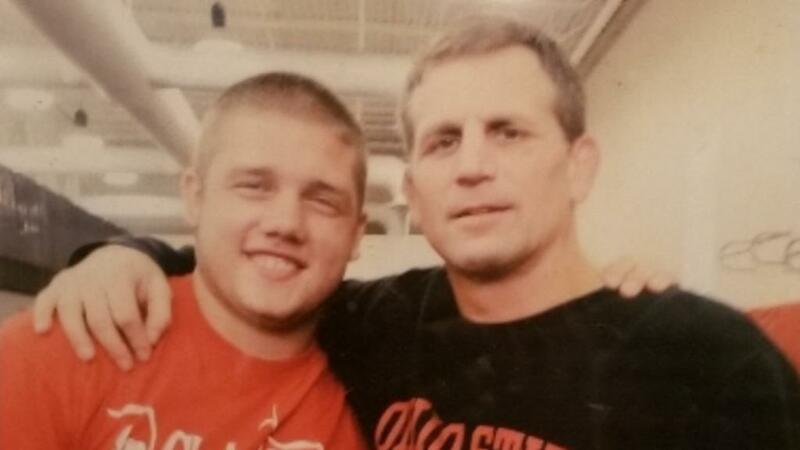 What will make his college wrestling career successful? Wilson responded without a stutter.